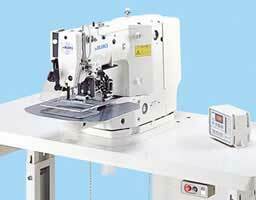 Every product in the LK lineup is provided with high-speed sewing capability and advanced features. 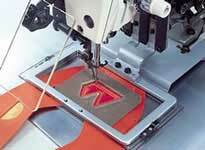 The machine runs at a sewing speed of 2,500rpm  Faster than any other shape-tacking machine anywhere in the world. In addition, the machine is fully equipped with state-of-the-art features such as a higher presser foot lift, a double-capacity shuttle hook, and a direct-control machine head that ensures quick response and an accurate stop position. The top model in the LK series, the LK-1930 is JUKIs first shape-tacking machine to incorporate a main unit	input function equivalent to that equipped in our automatic sewing machines. 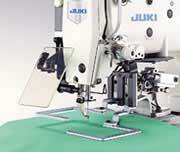 These rich features support the machines high-speed sewing performance and increased productivity. 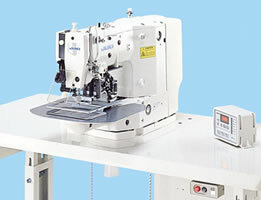 With its large sewing	area that matches a wider range of use, its hand pulley, and its highly operable and easy-to-understand operation panel, the machine delivers to the user dramatically improved operability. The LK-1910 Series shape tacking lineup is on the cutting edge  a pioneer in a new era of shape tacking. 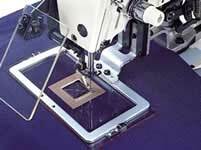 The machine achieves a maximum-grade sewing speed of 2,500rpm. The machine can shape tack at a maximum sewing speed of 2,500rpm, dramatically reducing the cycle time. Equipped as standard with a double-capacity shuttle hook that reduces the frequency of bobbin thread changes, the machine spares you troublesome bobbin thread works. This is a particularly great help when sewing with lower-count threads. 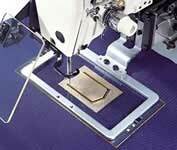 The machine can use a wider range of thread counts than conventional machines. With this feature, the LK Series models provide upgraded sewing capabilities such as improved responsiveness to heavy-weight materials. Select either the S type (standard type) or H type (for heavy-weight materials) to suit the use of your machine. Sewing area that matches a wider range of applications. 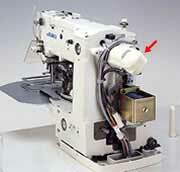 The machine has a wide sewing area: 60mm (length) by 100mm (width). With this large sewing area, the machine easily adapts to the sewing of curtain pleats, the finishing of waistband ends for jeans, label attachment, and many other sewing works. With its automatic correction feature, the machine can enlarge/reduce patterns without deforming them. Settings for machine functions such as the sewing speed and bobbin thread count can be easily adjusted via the operation panel, and cycle sewing programs for the production of combined patterns can be entered. The machine is provided as standard with an intermediate presser to prevent the material from flopping, thereby promising beautiful seams. Since height and stroke of the intermediate presser can be adjusted, quick responsiveness to changes in material thickness or the number of layers of materials is ensured. With an increased maximum lift of the feeding frame (22mm for the magnet-driven feeding frame and 25mm for the pneumatic-driven feeding frame), the machine ensures easy placement of heavy-weight materials. The feeding frame type can be selected to match the use of the machine in your work. Two different feeding frame types are prepared; the monolithic type (magnet-driven) and the separately driven type (pneumatic-driven). Select the type which best suits your work and the machine application. With the monolithic type you can lift/lower the feeding frame using a manual pedal* by controlling the pedal pressure. *The manual pedal is optionally available. The machine head is designed for improved operability. The hand pulley is located at the machine arm unit to allow the operator to visually check the needle entry and needle-to-hook timing with ease.  The machine is provided with a needle bar reverse rotating function. This permits the machine to stop with the needle rested at the highest dead point to allow a heavy-weight material	to be placed on the machine easily. Upgraded responsiveness, low vibration, and low noise create a comfortable workplace. With its direct-drive machine head (with no belt) directly joined to a compact AC servomotor, the machine provides improved responsiveness and upgraded stop accuracy. Vibration and noise are reduced even during high-speed operation, thereby achieving a comfortable working environment.